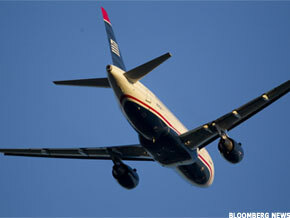 US Airways says it wants to grow internationally while awaiting the next round of consolidation. TEMPE, Ariz. ( TheStreet) -- US Airways ( LCC foresees that it may one day be involved in a merger, but the carrier made it known that it will not just sit around waiting for one to happen. US Airways, like most of its peers, is clearly in good shape, and investors are noticing: shares are up 121% this year, leading the industry. At the same time, US Airways remains an outlier. It is neither a global carrier with a vast international network, nor is it a low cost carrier. On an earnings conference call Wednesday, US Airways executives said the company remains interested in a merger, but is also prepared to remain independent while expanding its international network. "There is enormous shareholder value to be created simply by continuing to do what we're doing," said CEO Doug Parker. Regarding future consolidation, he said, "we are extremely well-positioned if indeed something more happens over time. If the four legacy carriers decide to consolidate to three, US Airways will be involved. Any of the three can do something with us. That's a good position for us and our shareholders." It remains unclear who would be US Airways' merger partner. Most speculation revolves around American ( AMR - Get Report), which has said it is not interested. In the meantime, US Airways will grow international, which currently provides only about 21% of total revenue, far below the level of the three other legacy network carriers. During the third quarter, Continental derived 54% of its mainline revenue from international operations. Delta ( DAL - Get Report) was at 47% and United ( UAL - Get Report) was at 46%. American trails slightly, with about 42% of mainline revenue derived from international, but that number will increase as American is able to take advantage of antitrust immunity agreements across the Atlantic and Pacific. President Scott Kirby said he views the discrepancy as "a unique opportunity for us." He said US Airways has been expanding service to Europe from Charlotte and Philadelphia over the past few years. Additionally, the carrier began flying from Charlotte to Rio de Janeiro last year and will add Charlotte to Sao Paulo, as well as to Dublin and Madrid, next year. Looking ahead, US Airways will continue to add service from Charlotte to South America "as opportunities are there and as rights are there." The carrier will also add service from Charlotte and Phoenix to Europe, Kirby said. Eventually, US Airways could fly to Asia as well. It was awarded a Philadelphia - Beijing route in 2007, but decided not to fly when the economy collapsed. Kirby said Asian service is most likely linked to deliveries of the A350, which could begin around the middle of the decade. Parker reiterated that US Airways has a revenue disadvantage because it lacks the type of major business hub, such as Chicago or Atlanta or Newark, that would enable hugely profitable international flying. As a result, US Airways is able to sustain margins that are equivalent or superior to its peers' only because of a cost advantage, primarily due to lower labor costs. "This doesn't mean we can't increase wages, but what we cannot do is to get to the position where our labor costs are the same as costs at those with higher revenue generation capabilities," he said. "There are opportunities for growth, but they will not close the revenue gap."